Today i cleaned up our storage room . I don’t know what is the right word for it, but I mean a 2×2 windowless room, where we dump all the stuff that we don’t need every day. I had to put another box in it but II couldn’t open the door anymore, so I had no choice but to clean it up. Well, to be really honest, my love sort of asked me to do it. I will spare you the details, but there is one thing I do like to share with you: a build-it-yourself electronic organ kit. It was probably made in the late seventies or early eighties by a company named Science Fair. I bought it a year ago for my son, because I liked it. Every parent knows how stupid that is: buying things for your kids because you like it yourself. My son never touched it. If anybody wants to have it: just ask. All i want in return is the money for the postage (the kit has the size of a shoebox and is not heavy) and a CD with some tunes played on the organ. While searching for an organ LP by Mario Ruspoli ( which I could not find, so you will read about that later), I was playing some other organ records tonight and I thought it is a brilliant idea to put one of my favourite tunes in this blog today. 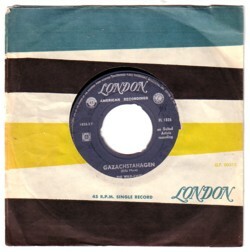 It is Gazachstahagen , the flipside of a 45 by The Wild Cats. On the A-side is Billy’s Chacha , which is also a nice tune, but I like Gazachstahagen much better. I remember that I read about The Wild Cats somewhere in an article, long time ago, but all I can remember that I thought that this was an obscure record, but it was not. And there was a famous musician playing in the band, whose name I also cannot remember. If you want more interesting information like this, just ask for it! Hey there, thanks for all the great music and info. I suppose you already given away your electronic organ kit? 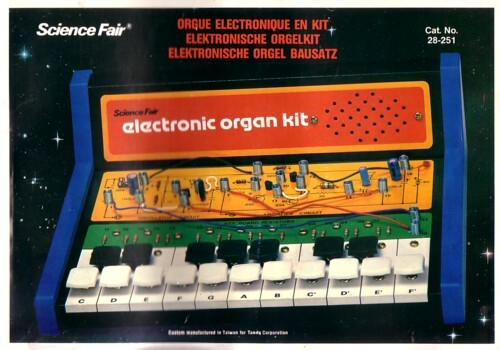 I have one of these electronic organ kits by Science Fair. If you are interested in buying it, send me an email. Thanks, Eric H. Dec. 2018.